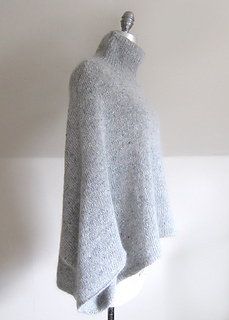 Mayu is an easy to wear pullover that is perhaps best described as a stylish poncho with sleeves. The tweediness of the Fine Donegal and the soft halo of the Silk Cloud combine to create a beautiful fabric that is both slightly rustic and decidedly sophisticated. Cozy and chic! 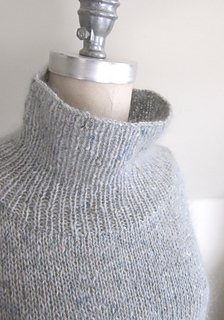 sweater, the turtleneck is added by picking up stitches around the neck opening. The two yarns are held together throughout. You want to place the knitting on a flat surface with the front facing you and the back pieces sticking out on either side of the front. Actually, what you see are the sleeves. 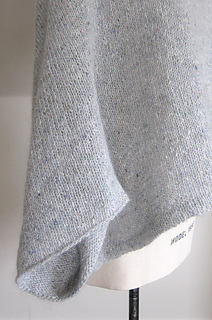 Depending on the size you knit, you want to follow the measurements given in the pattern and seam the upper edge of the sleeve for the given number of inches to the front, i.e. 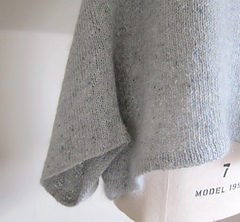 you fold the top of the sleeve downwards (1). 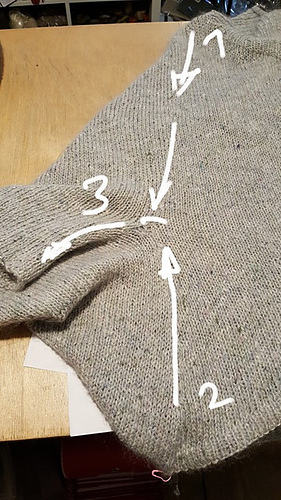 Then you seam the lower part of the sleeve (starting from where the rib on the back ends and the marker is placed) up the lower part of the front (again, follow the inches given in the instructions) until both edges meet (2). Then seem these two together to form the sleeve (3). Note: Pattern updated on March 30th, 2017 to adjust required yardages for the two larger sizes and to include schematic. 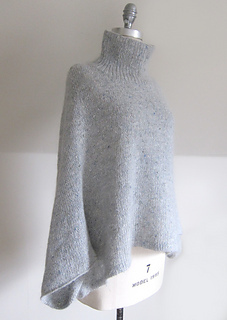 Note: Pattern was updated on January 17th, 2017 to indicate that body is knit with the larger needle size while neck is knit with smaller needles. Also, on the second to last decrease section for both parts of the back, “repeat once more” has been corrected to “repeat 2 times more”.